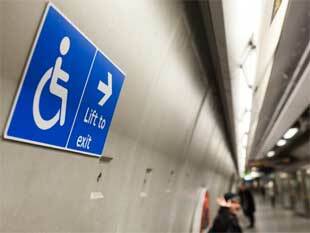 Step-free access to many of Hounslow’s stations proceeding at pace! Many of Hounslow’s stations – Underground and mainline rail are to receive investment to improve accessibility for residents and visitors as part of a range of measures being pursued by Hounslow Council to improve its transport infrastructure. Plans to improve accessibility at Syon Lane Station were given the green light this week as Hounslow Council confirmed securing the necessary funding for the £2.4m programme to proceed. Improvements to the station, which sits on the South West Rail (SWR) network, will include a new footbridge, providing an additional exit point and lift from the west bound platform, delivering step-free access to the street from this platform, as well as easing congestion. A new (wider) staircase and bridge deck is proposed for the London-bound platform which should also reduce congestion at peak times. Step-free access from this platform to the street will be enabled by improvements to the footpath leading to Rothbury Gardens. Works will commence at the end of April and are due to complete by the end of the summer. The scheme is being financed by a cocktail of funding streams including; Sky, Community Infrastructure Levy (CIL), Transport for London (TfL) and a contribution from SWR themselves. The total cost is c£2.4m including contingency. In addition, Hounslow Council has just received confirmation of its successful joint bid with South Western Railway for funding through the Department for Transport (DfT) Access for All programme, to finance improved accessibility to Isleworth Station. The programme stems from the Government’s Inclusive Transport Strategy, and overall 73 stations have been selected to benefit from this additional £300m fund. Details will soon emerge of this very welcome project which will see Isleworth Station fitted with lifts in the near future. In addition, at Gunnersbury station, the council is continuing to work alongside TfL, Network Rail and the owner of Chiswick Tower to explore how development in this area could deliver improved access from the street to the platform, including lifts. Kew Bridge is also set to benefit from accessibility improvements when the new Brentford stadium opens. The London-bound platform is to be made step free and the council is working with SWR and NR to explore how step-free access from the country-bound platform to the street can also be delivered. A feasibility study is due to progress later this year. Meanwhile, two of the borough’s Underground stations; Osterley and Boston Manor, are to receive accessibility upgrades as part of TfL’s Step-Free Access programme. The programme, introduced by Mayor Sadiq Khan, will see the number of step-free Underground stations on the network rise to over 100 by spring 2024 comprising 38 per cent of the network, compared to 28 per cent in 2018. Osterley station will be upgraded to step-free access in 2019/20, with accessibility improvements to Boston Manor station scheduled for 2023/24. “It is great news that access to Hounslow’s transport network is to be considerably improved at a number of key locations due to these various initiatives, improving accessibility for everyone, and most importantly for those with restricted mobility.